'Deutsche Erstausgabe' stated on back cover, but there was no prior edition of this anthology. 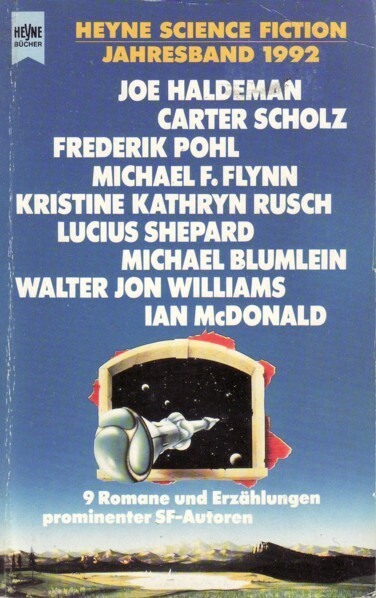 Translations by Irene Bonhorst (Scholz, Shepard and McDonald), Uwe Luserke (Flynn and Rusch), Winfried Petri (Haldeman), Christian Mähr (Blumlein), Ralph Tegtmeier (Pohl) and Jens Withöft (Williams). It's not entirely clear if it's the novella or the novel version of Haldeman's 'The Hemingway Hoax': the novella is stated in the credits, but the length suggests the novel. Month of publication from 'Science Fiction Times, Januar 1992'.